Bel'am, Yaish, Addas, Yessar, Cebr, Salman the Persian. What does the Quran say about this? In the verses following the one above, the ‘infidels’ are threatened and defined as ‘liars’, ‘slanderers’ and they are informed that ‘a grievous punishment’ awaits them. In the verse above, it is said that the person who was said to be instructing Muhammad was a foreigner, not an Arab. Some people claim that it was a Greek slave named Bel'am who taught Muhammad. The first original scripts of the Quran were written on small stones, pieces of leather and wood, bones and similar things. All of them were burnt! The second original of the Quran verses were gathered together during the time when Abu Bakr was the Caliph. They were burnt, too! The third original one consisted of “yazmas” (manuscripts) copied during the time when Othman was the Caliph. They do not exist anywhere in the world! “All that was written in the original Quran was conveyed into the “Mushafs” (later copies of the Quran) by Othman, so there was no need for the original one. If it had not been burnt, some suspicions would have arisen and the doubts around the “Mushafs” would not have ceased. I was afraid of that, so I had the original scripts burnt.” (Ref. : ıb Ebi Davud, Leiden 1937, pub., p.243-Suphi e's-Salih Mebahis Fi ulum-il Kuran). What is the meaning of this sentence ? It has been told that Mohammed had treated many people with spittle. His son in law Ali was one of them. A müslim ;He has aching eyes. After this conversation,Ali comes to Mohammed and Mohammed spits to Ali's eyes and treats him. As known curse means bad wishes,revile and malediction. The one who is in the lower status wishes something from the one in upper status. wish him to fall in a bad situation.You wish from a superior power. But it is incomprehensible if Allah wishes! As Allah is the superior power, from whom does he wish? This is unacceptable. Quran interpreters have difficulty in explaining curses of Allah,and they are unable to give intelligible answers. Where is the quran's god? 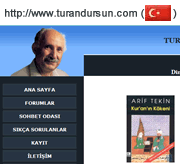 Have you ever hear about Turan Dursun?